The tyres-guru.co.uk store is your online tyre and rims specialists. That is why we offer you alloy rims and steel wheels in addition to all-season, winter, and summer tyres for all kinds of vehicles. 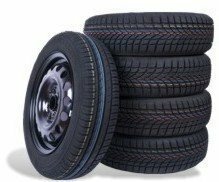 You can even shop for truck, van, and SUV tyres here. If you are looking for complete wheels for all-season use, our steel wheels with all-season tyres by many top brands might just be the right choice. From light snow to heavy rain and completely dry roads, these wheels are meant to keep you safe. In addition, our classy steel wheels can enhance the appearance of your car and give it the look that you have been hoping for. The right tyre fit, size, and profile are important to your safety and driving comfort. That is why we provide you with our special vehicle selection tool, which is incredibly easy to use. Please let us know a few details about the vehicle you drive, whether its truck or SUV so that we can suggest the matching tyres by many top brands. In case of further questions, you can refer to your vehicle’s manual or contact customer service. If you are wondering whether mainland UK shipping is included in the purchase price, you should know that we do indeed offer free delivery.